CAN SUPPORT THE ONES YOU LOVE. 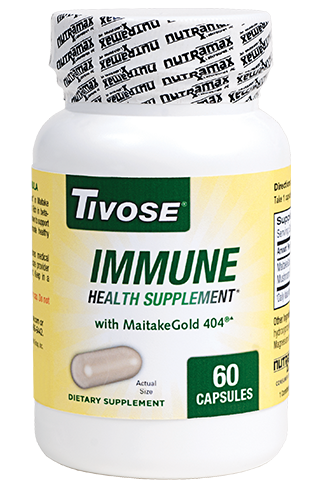 TAKE TIVOSE® IMMUNE HEALTH SUPPLEMENT TO SUPPORT YOUR BODY'S IMMUNE DEFENSES*. Not all mushroom extracts are created equal; that’s why we chose MaitakeGold 404®▲. The MaitakeGold 404®▲ found in Tivose is a concentrated extract of maitake mushroom (Grifola frondosa) containing bioactive beta-glucans that provide immune support even at low doses.1 It has been shown to support the body's immune defenses and promote healthy immune function. Serving Size Information: One serving of Tivose contains 15 mg of MaitakeGold 404®▲ mushroom extract. Directions for Use: Take one (1) capsule per day with or without food. If you have a condition that requires medical attention always consult your physician before taking any dietary supplement. NSF has worked for over a decade with sports organizations, anti-doping agencies, and supplement manufacturers to evaluate and test these products and to help ensure their quality and safety. Your immune system is your body's natural defense system against germs and microorganisms. Weakened immune defenses could lead to taking time off of work and passing your symptoms to family and friends. A healthy lifestyle starts with a healthy immune system so consider getting 7-9 hours of uninterrupted sleep each night, eating a diet rich in fruits and vegetables, avoiding chronic stress, getting proper exercise, and taking a high quality immune health support supplement. Why should I take an immune health support supplement? Your immune system can be affected by many factors such as stress, poor nutrition, lack of exercise, even too much exercise, and not enough sleep. With today's hectic pace, these factors can become part of daily life. 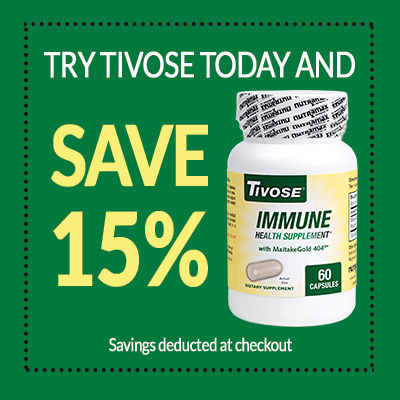 Tivose® is a simple way to help support your body's immune defenses. 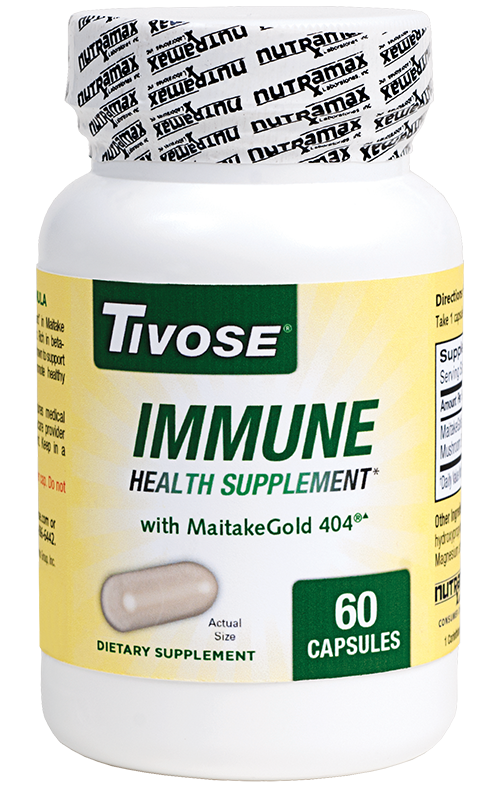 Tivose® is an immune health supplement that contains MaitakeGold 404®▲, a concentrated maitake mushroom extract rich in active beta-glucans to support your immune system and promote immune function. 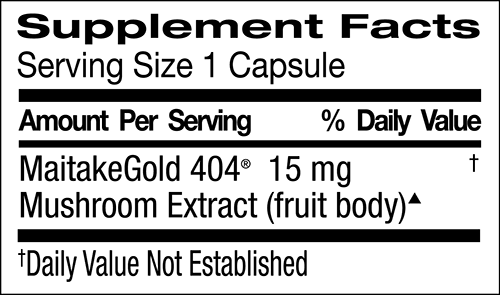 What is MaitakeGold 404®▲ and what is its benefit? The MaitakeGold 404®▲ found in Tivose® is a concentrated maitake mushroom extract containing bioactive beta-glucans that helps provide immune support. Maitake mushroom provides specifically beta 1, 3-1, 6 glucans that have been shown to support the body's immune defenses and promote healthy immune function. Beta-glucans, the active ingredient in Tivose® are considered immunomodulators, or substances that help to regulate the immune system. Beta-glucans have been found to promote neutrophil function and natural killer cell activity, thereby helping to support your body's immune function. Beta-glucans are naturally occurring polysaccharides that can help support the immune system depending on the specific structure. Immunomodulators are substances, like the beta-glucans found in MaitakeGold 404®▲, that help modulate or regulate the immune system. Neutrophils are white blood cells that ingest foreign particles and infectious microorganisms to clear them from the body. Natural Killer cells are white blood cells that function to remove cells with foreign material. How should I take Tivose®? Tivose® is intended to be taken once daily with or without food and can be taken year round. Yes, Tivose® is vegetarian. The active ingredient is beta-glucans derived from a maitake mushroom extract and it is encapsulated in a clear vegetarian capsule. ▲ MaitakeGold 404® is a trademark of Tradeworks Group, Inc.